It sometimes happens that through flood, hurricane or in this year’s case, low water, we have to adapt our travel schedule. 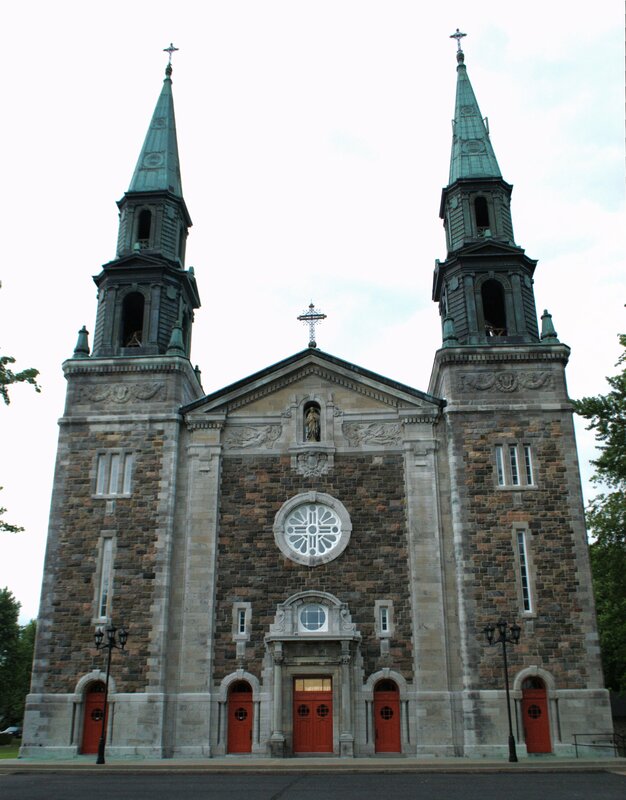 We had planned to spend several days in St. Anne-de-Sorel as a part of their annual Gibelotte Festival. Unfortunately, word reached us while enroute that the low water conditions had reduced the depth at our proposed dock from eight feet to less than two. We sent a scouting party to examine the conditions and found that they were as reported and a search revealed that no alternative dock was available in the busy harbor. As we contemplated a “Plan b”, an invitation from Natalie, a representative of La Monteregie, La Route du Richelieu, came to us requesting our presence at a special event scheduled for Saint Denis on July 4th. A quick check of the now changing schedule suggested that by moving a few dates up and down it would be possible to attend. 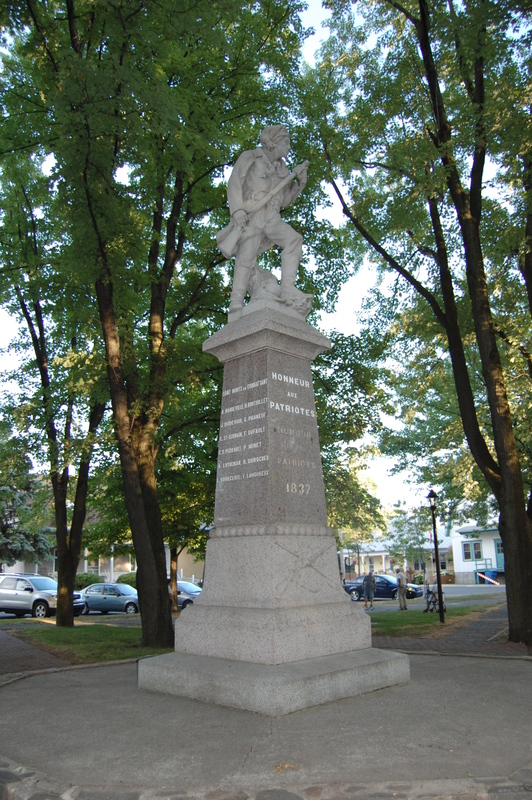 Saint Denis, as the new Richelieu River heritage initiative being announced indicated, was one of the central communities involved with the Patriots movement of 1837-38. A new heritage guide, Richelieu River: Valley of Memories, published by Parcs Canada, details the history of this social movement, inspired in part, by our own American Revolution. The Patriots was an effort by Canadians of all backgrounds to press the British government for more representation in the government of their affairs. The more I learned about this important chapter of Canadian history the more it just seemed right that we would be participating in the event on July 4th. Saint Denis had been one of the Richelieu River’s early commercial centers with a busy harbor and many ceramic manufactories. Today, a cable ferry serves the harbor and the restored dock is accessed through a narrow channel. Captain Roger’s excellent knack of finding the unmarked channel brought us to Saint Denis’s dock in plenty of time to join the celebration taking place in the park next to the Patriots Museum. Here, we met officials from up and down the Richelieu Valley, many of whom we have established close relationships with from our present travels and our visit in 2008. The Lois McClure and her crew were recognized from the podium and the attendees were invited to board the boat during our afternoon public hours. I am pleased to report that most of the assembled mayors and tourism representatives took advantage of our presence to do just that. Today, Saint Denis, the site of an important Patriots battle and the Patriots Museum is considered by many the center of the Patriot movement. It was in Saint Denis that on November 23, 1837 that the Patriots led by Dr. Wolfred Nelson achieved victory in a battle against British regulars. The armed resistance was eventually suppressed and many of the Patriot leaders took refuge just across the border in northern Vermont and New York. The new Heritage Guide* and trail along the Richelieu River highlights the places and monuments that recognize this important chapter in Canadian history. Anyone looking to learn more about this important chapter of history is well served to begin their study with a visit to Saint Denis sur Richelieu.